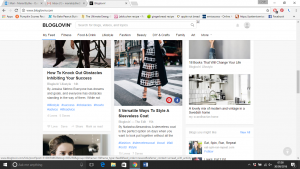 I have used Bloglovin’ for a while now to keep track of the blogs that I read. It’s easy to search for blogs, put them into categories, and you can see right away if there are new posts to read. Now I appreciate it is a free website so it has to pay for itself with adverts, but my feed is getting more and more clogged up with just nonsense. So many of them are to do with fashion which I am not just interested in. Not sure if it comes out but one of the ones above is something like “Five versatile ways to style a sleeveless coat”. My first thought is what on earth is the point of a coat WITH NO SLEEVES??? A coat is to keep you warm, or dry, and I want my arms included in that. There have been nonsense ones about “How to wear white” (put the clothes on???) or “How to be beach body ready” (take your body to a beach? )- the thoughts in my head bubble with sarcasm as I read the feed and click “mark as read” over and over again. Argh! I really like Fat Face and find that their clothes and things are good quality- but this is the second of their bags that has broken. 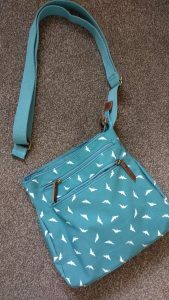 I bought this bag at the end of July, and at the end of August when I was walking into town, the strap broke and the bag fell on the floor. As I don’t have the receipt any more (who keeps receipts once they have taken the tags off?) and since then it’s been in the sale, they have been a bit funny about it. The online people told me to go into the store, the store would only exchange but they didn’t have any in stock, so now I have sent it off with my bank statement to prove that I paid full price in the hope of a refund. I feel that seeing as their product is not up to scratch they should be a bit more apologetic. Grrr. 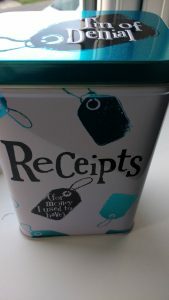 I’ve bought this tin to keep my receipts in now (yes, I could just use any old box, but why when I can buy a labelled one?) so that now I am not going to throw them away until I’ve had things for much longer. Take that Fat Face (next time something breaks…). Usain Bolt racing James Corden (who was doing the proper ear to pocket with his arms). Bolt is just such a character and clearly so competitive too! 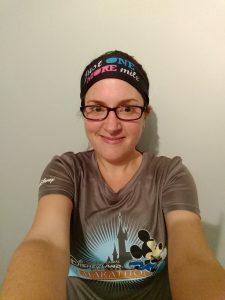 I also love my Run Disney top! It’s more t-shirt than vest weather now, so it’s perfect for runs (although soon it will be covered by my high-viz vest). Does anyone else use Bloglovin’? Any tips to get rid of the rubbish? I thought it was just me that had these silly fashion posts appear all over my feeds. I just don’t case enough about fashion to want to read it. Get over it Bloglovin! That is rubbish about Fat Face – usually they’re so good. I need to keep my receipts more, and I have to admit, I do like my receipts emailed to me if there is an option to do so. Glad it isn’t just me with Bloglovin’- so annoying! I love online shopping as then there is always a receipt, but because I bought it in a store I don’t have that to hand. Previous Previous post: Disneyland Paris half marathon!